Want to send a unique, creative card to someone for their birthday, a holidays, or for any other occasion? Use this simple tutorial to make a greeting card in Adobe Illustrator. Let’s get started! 1. 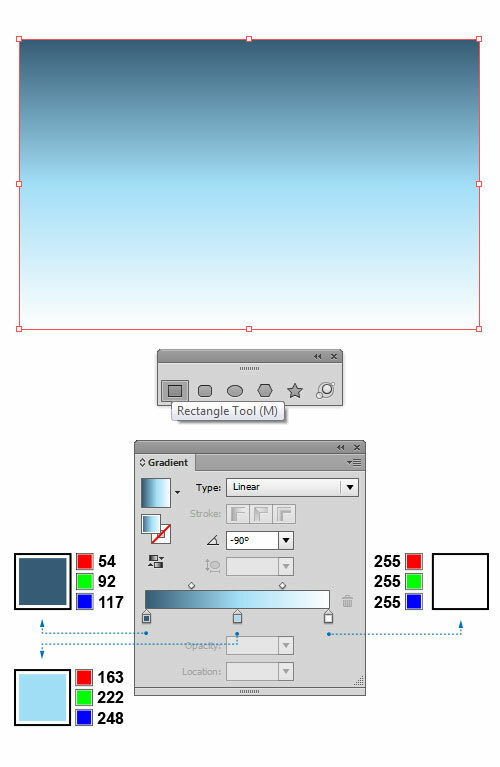 Create a blank document and set the artboard dimensions to 800 x 480px. Now grab the Rectangle Tool (M) and make a rectangle that is the same size as your artboard. Activate the Gradient Panel and fill the selected object with linear gradients as shown below: dark blue (R=54, G=92, B=117), light blue (R=163, G=222, B=248) and white (R=255, G=255, B=255). 2. Let’s create a huge paper card standing in front of the colorful background. 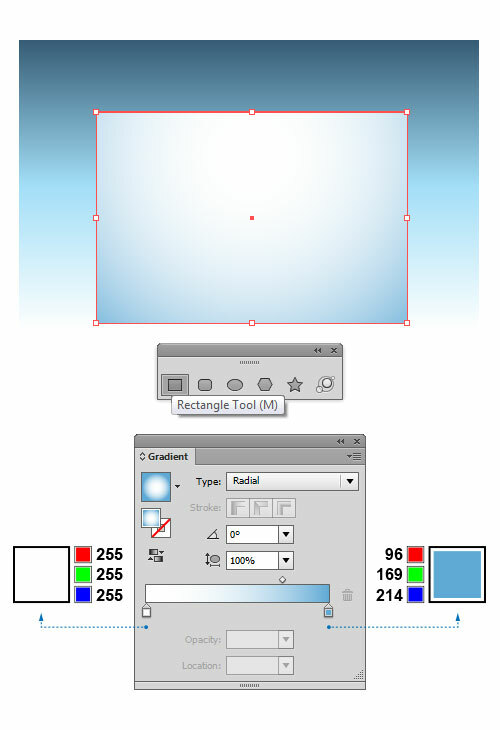 Grab the Rectangle Tool (M) again and create a rectangle, whose dimensions should be set to about 515 x 350px. While the object is still selected, open up the Gradient Panel and apply the following radial gradients: white (R=255, G=255, B=255) and light blue (R=96, G=169, B=214). 3. Grab the Ellipse Tool (L) from the Tools Panel and create a circle. Using the Direct Selection Tool (A) click on the lower anchor point of the circle and drag it down a bit, in order to create the general shape of the balloon. If you want, you can modify the shape by pulling control handles of the anchor points. Now you need to simulate volume and mass to the balloon with a radial gradient. Open up the Gradient Panel and fill the resulting shape with radial gradients as shown below: white (R=255, G=255, B=255) and light blue (R=96, G=169, B=214). 4. To further simulate the look of a balloon, add highlights or hot spots to the shape. These highlights are simply oval shapes positioned on the balloon. Fill the selection using the Gradient Panel with a white to white linear gradient. One of these whites should be 100% transparent. To apply another highlight, create a curved line, as shown in the image below. Keep the path selected, and in the Stroke Panel choose the ‘Width Profile 4’, to change the Variable Width Profile of the stroke. Apply the same gradients as we did for the previous highlight. 5. Next, using the Pen tool from the Tools palette, draw a loose oval shape at the bottom of the balloon. This will serve as the end of the balloon that was tied in a knot. To color the object, use the same gradients as we did for the balloon itself. To complete the effect, using the Pen Tool (P), draw a loose line for the string and apply a fill of none and a stroke of 0.1 point. Finally, apply gradient within the stroke by using different shades of grey. 6. Let’s create several color variations of our balloon. The most convenient way is to use the Recolor option. Select all the objects and group them first (Ctrl+G). Then, make 5 copies of the blue balloon and save them for later. Select the first copy and go to Edit > Edit Colors > Recolor Artwork and menu will then pop up. From the Edit option a color wheel will appear. The color wheel is equipped with nodes, which you can drag to any part of the color wheel. To change the entire color scheme simultaneously, enable the Link harmony colors icon. After deciding on the color adjustments, simply click OK. Do the same with another copies of the balloon (refer to the image). You can repeat this step for as many colors as you want, but try to keep it around 6. 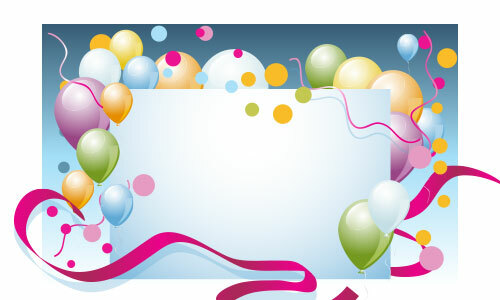 Now create several copies of each balloon and arrange it all over the background, as you can see in the image below. 7. We should add some decorative ribbons. First, grab the Paintbrush Tool (B) and draw a freehand path, as shown below. Keep the path selected, and in the Brushes Panel click on the New Brush button. Pick the Calligraphic Brush option to open the dialog box. When the Calligraphic Brush Options appear, enter the shown values and click OK. Now go to the Gradient Panel and fill the selected path using alternating colors between light pink (R=235, G= 2, B= 138) and medium pink (R=169, G=40, B=88). To get the realistic effect, apply a cast shadow to our new object. To do this, go to Effect > Stylize > Drop Shadow and enter the values as shown in the image below. Once done, you can place the ribbon in front of the paper card. Using the described techniques, create another path and apply our new ribbon brush to it (we don’t need shadow for this one). 8. Let’s create another type of ribbon, the one with round edges. To create a new brush, we can use an existing style we have created previously, but we’ll need to alter the settings for this one. To create a brush like this, select the brush that we want to duplicate and choose Duplicate Brush from the Brushes Panel pop-up menu. To edit that duplicated brush, double-click the duplicate brush or select Brush Options from the pop-up menu. In the Brush Options dialog box, change the brush to your specifications. Take the Paintbrush Tool (B) from the Tools Panel and draw a smooth curved path. Open up the Brushes Panel now. To apply the brush style, keep the path selected, and click on our new brush. As we done it before, apply some cast shadow to the path (Effect > Stylize > Drop Shadow). Finally, create several more paths all around the background (no need for cast shadows this time). 9. We need some celebration confetti elements, in order to complete the background. So, grab the Ellipse Tool (L) and create a small circle, whose dimensions should be set to about 20 x 20px. Open up the Color Panel and fill the object with light blue (R=98, G=150, B=176). While the objects is still selected, in the Brushes Panel click on the New Brush button. Pick the Scatter Brush option to open the dialog box. When the Scatter Brush Options appear, enter the values shown in the image below and confirm with OK. In the Brushes Panel choose the brush we have just created and using the Paintbrush Tool (B) draw a few freehand paths over the entire background. In the Stroke Panel select different stroke weights as indicated. To go even further, consider changing the color of each stroke, so it looks more interesting. That’s it. I hope you’ve enjoyed reading this tutorial.